These two-piece aluminum front covers allow quick camshaft removal and installation without the need to remove the damper pulley or steering components. The cam can be installed and removed through a window in the front of the cover which is sealed with a plate and o-ring for superior leak prevention. This stamped steel chrome timing cover for small-block Chevrolet has a reinforcement plate welded to the inside of the cover for additional strength. It prevents camshaft walk when used with a thrust button, making it ideal for use with roller cams. Includes front crankshaft seal. This die-stamped two-piece front cover for small-block Chevys is made from .090” aluminum for light weight and excellent strength. This attractive and unique design allows quick camshaft removal without dropping oil pan or breaking oil pan seal. Includes all necessary gaskets, bolts and seals. Will not fit 1987 and later engines. Note: If cam button is desired, a nylon cam button must be used. Our die-cast polished timing covers for Chevrolet come with pan seal, allen head bolts, gaskets, washers, and timing marker. #4240 won’t fit 1987 & later; #4241 won’t fit 1991 and later big-block Mark V engines. These new die-cast aluminum timing covers for Ford are stock replacement parts for late model EFI 5.0L and 351W engines. Includes gaskets and crankshaft seal. Both are compatible with stock or Edelbrock Victor Series aluminum water pumps. 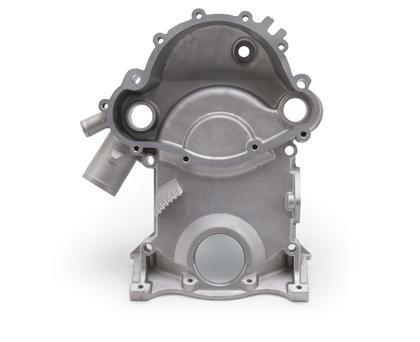 This die-cast aluminum timing cover for Pontiac comes with pan seal, gaskets and timing marker. Designed to fit 1969-79 350-455 c.i.d. Pontiac engines. Compatible with stock or Edelbrock Victor Series aluminum water pump #8856.